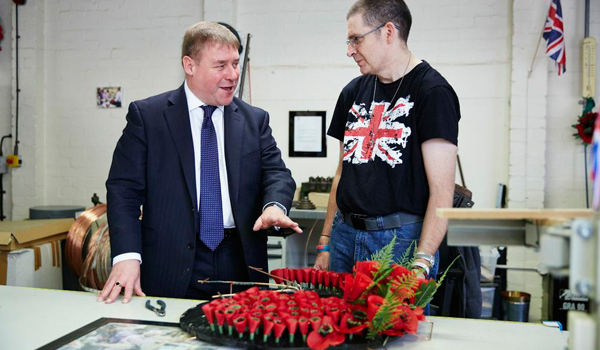 MARK Francois, Minister of State for the Armed Forces, visited the Poppy Factory’s Richmond headquarters recently to experience first-hand the work undertaken by the charity on behalf of disabled veterans. The Minister met with employees and key personnel, including Chairman Mark Perowne and Chief Executive Melanie Waters, to talk about the challenges facing ex-Servicemen and women as they leave the Armed Forces to join civilian life and the role the Poppy Factory plays in increasing opportunities to employment. The team has helped 140 disabled veterans into meaningful employment in 2013 alone. The Poppy Factory believes that any disabled veteran who wants to work should be able to and aims to become the recruitment provider of choice for its ex-Forces clients and employers alike. The talents of those leaving the Forces can be a big asset to business and civilian organisations and, as more soldiers are leaving the Services, there has never been a more important time to raise awareness of their skills and increase access to meaningful careers.